There’s a Dolomite Mountains Trip for Everyone! 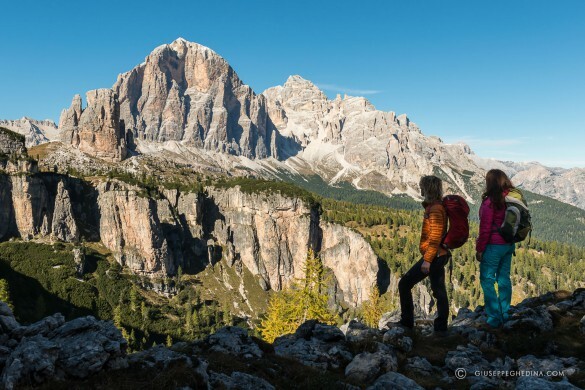 That’s right, there truly is a Dolomite Mountains Trip for everyone! Whether you’re a hiker, skier, climber, or cyclist; a summer or winter outdoors enthusiast; looking for a relaxed vacation or up for a challenge – we have a trip for every interest and activity level. To help you chose the trip that’s just right for you, each trip has an activity level. These range from easy to challenging, based on the terrain encountered and level of exertion required. Easier trips stay down in the valleys, or use lifts to reach higher elevations for activities. As the trips increase in difficulty, steeper or rockier paths are encountered, and fewer lifts and transfers are used. Check out the activity level descriptions below for more information! Of course, we’d be delighted to assist you in selecting the perfect trip for you – call or email us and we’ll help guide you. Whatever level of trip you chose, you’ll have spectacular vistas of these incredible mountains throughout! Our easy trips are perfect for people who want to see the Dolomites at a relaxed pace, are more interested in the flora and fauna and the cultural and historical aspects of the region, and for families with small children. Our easy to moderate trips are great for people who want to see the Dolomites at a relatively relaxed pace, yet still want to feel like they got some exercise, and for families with children. Moderate trips are active, with full days of activities. These trips are perfect for people who want to be active, yet still have some time to explore the cultural aspects and opportunities for relaxation available in the Dolomites in the afternoon. Our moderate to challenging trips are demanding, with a whole lot of fun along the way. There will be no question in your mind whether you accomplished something at the end of each day! Our challenging trips are exactly that – challenging! These trips are designed for guests in excellent physical condition, who have a strong spirit of adventure. We can customize a trip specific to your needs and desired level of activity. Want layover days? No problem! Need extra hikes? Our guides LOVE that! Call or email us and we’ll create your Dolomite Mountains trip of a lifetime! At your service with Dolomite Mountains. From luxury hotels to quaint mountain inns, expert guides, incredible cuisine, and door-to-door service, we have you covered. Call Dolomite Mountains today at +1 866 247 4860. Hiking in the Dolomites can be anything from a leisurely stroll through a high altitude meadow, to what seems to be a never-ending vertical climb. With hundreds (if not thousands!) of miles of well-marked trails in the Dolomites, you get to choose how much you bite off! The Dolomite Mountains offer excellent road biking. There are plenty of steeps and passes to ascend – the mountain stage of the Giro di Italia race takes place here most years! But don’t worry – it’s not all uphill – there are also lots of flat meandering trails that will take you from charming town to charming town, or north to the border with Austria! One of the best ways to explore the Dolomites is by mountain bike. High passes followed by lush, green valleys create dramatic ascents and descents that make for exhilarating bicycling and sightseeing alike. 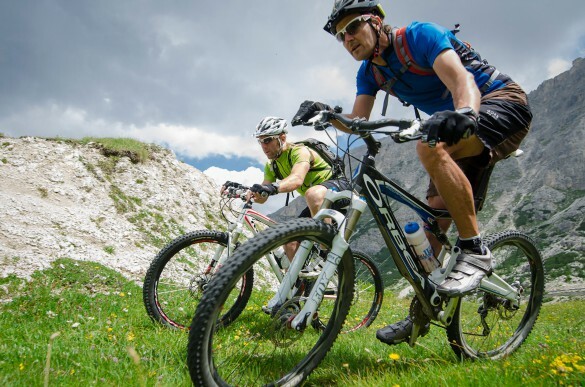 Whether you prefer easy mountain biking on gravel or fire roads, or challenging yourself on an exposed single track, Dolomite Mountains has itineraries for mountain bikers of all abilities and interests. 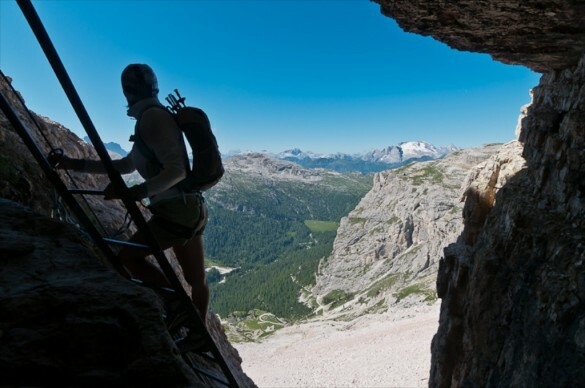 The Dolomites are truly a rock climber’s paradise, and have long been sought after by climbers from around the world. There is something for every experience level here – whether you are a first time rock climber, or are already comfortable hanging from a rock wall, our guides can lead you into (or higher up in!) the vertical world of the Dolomite Mountains. 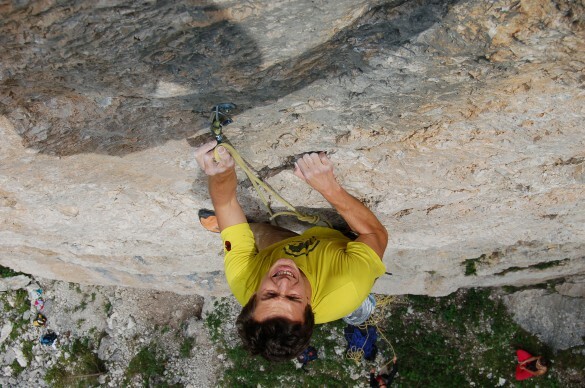 Climbing a via ferrata is certainly an adrenaline rush! Not only can you reach the airy heights traditionally reserved for rock climbers and mountaineers, you can also follow the iron cables and metal ladders that legions of soldiers climbed on during WWI. Completely protected, attached to a system of anchored cables while you climb, you will be stopped in your tracks by the amazing vistas from seen from high above the valley floors! 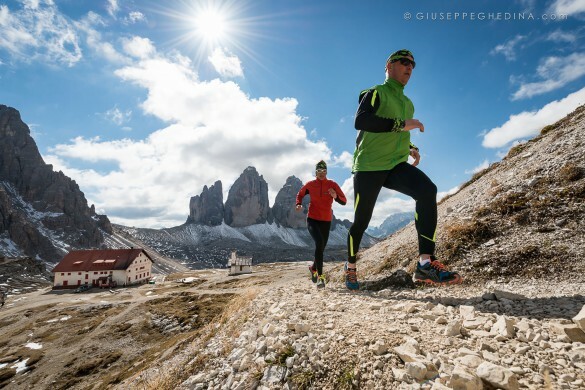 Trail Running in the Dolomites ranges from a leisurely jog through a high altitude meadow, to runs with dramatic vertical gains and losses. With hundreds (thousands?) of miles of well-marked trails in the Dolomites, you get to choose just how hard (or easy) you want to go! The Dolomite Mountains boast the number one ski resort in the world with lift-service access to over 5,000 vertical feet of skiable terrain for both on- and off-piste adventures, and countless miles of backcountry trails to boot! 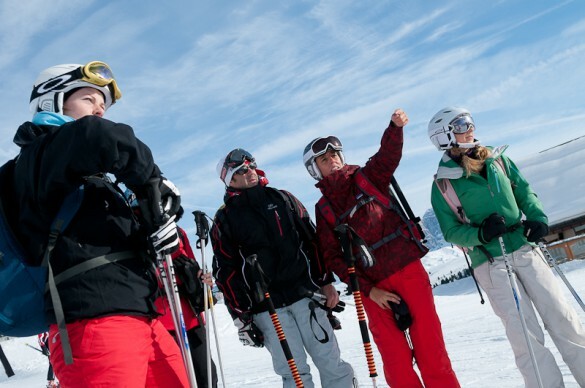 Whether you’re a novice or expert skier, there are plenty of options to choose from for your winter holiday in the Dolomites. Best known for downhill skiing, the Dolomite Mountains are also a mecca for cross-country skiing. 231 tracks across 12 resorts comprise over 1,280 kilometers (795 miles) of trails. You can spend a relaxing day touring the flats, test your limits on FIS-certified competition tracks, or ski from point to point, resort center to resort center, along an interconnected web of trails. 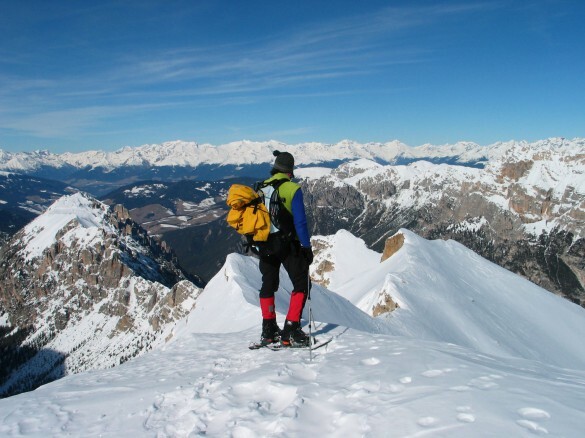 Following many of the same trails used by hikers in summer, snowshoeing in the Dolomites can be anything from a leisurely stroll through a snow-covered high altitude meadow, to what seems to be a never-ending vertical climb. 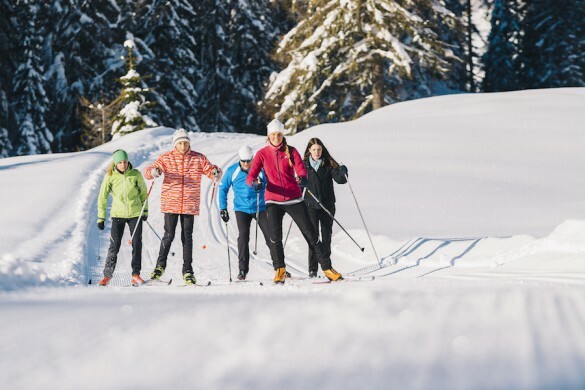 With hundreds of miles of trails in the Dolomites – and the convenient option of ski lifts – you get to choose the level of adventure that’s right for you!